Sorry for not updating before now! I did have a good reason though. 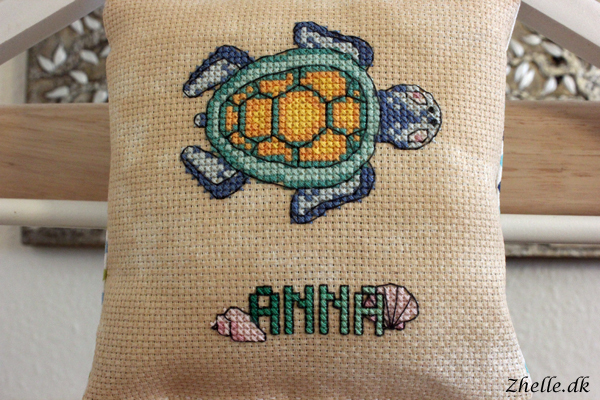 I have been working on a birthday present for my dear friend Anna. She got about half an hour ago, so now it is okay to show you, what it is! Anna is a reader of this blog too, so I didn't want to spoil the surprise for her. If you want to see the pictures in a bit more detail, remember that you can click on them, to get them larger. 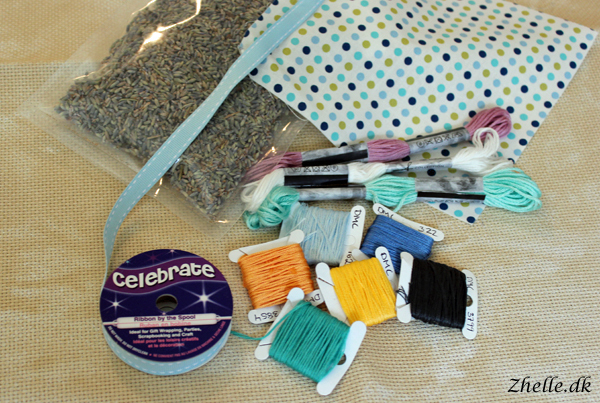 These were the materials I picked out to do her present. There's marbled aida from DMC in a sand colour, some dotted fabric from Tilda, blue ribbon, various threads and lavender! 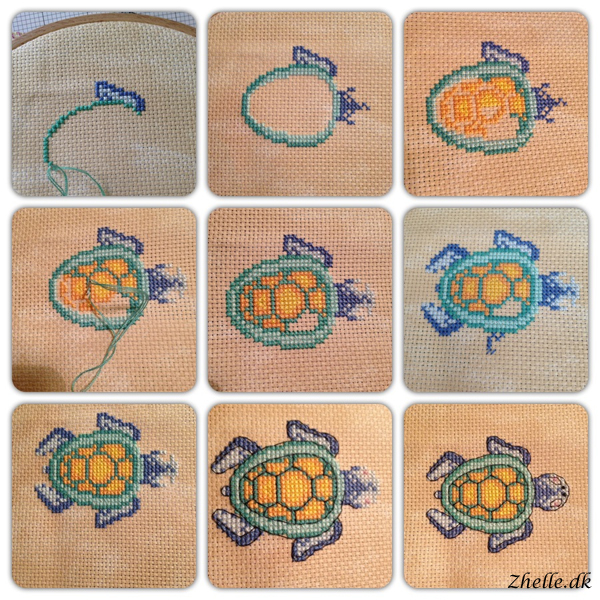 Here is the progress on the turtle almost step by step. The colours I used were not the exact ones described as I didn't have them. I do think it ended up pretty good anyway though. The change in colour is whether it was natural light or a lamp that was lighting up the picture. When I finished the turtle, I had a few ideas that would make it a bit more personal - after all it is a gift to a very dear friend of mine. I looked through a lot of my CrossStitcher magazines and found a cute sea shell I wanted to add. I actually wanted two, so I designed the other one myself. 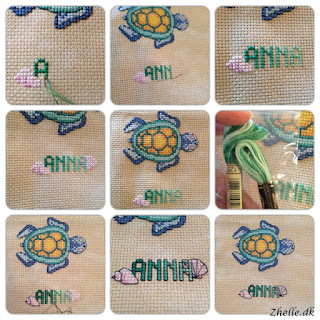 Also I wanted a bit of play with the colour, so I finally tried some of my variegated thread on Anna's name. The result looks slightly askew, but the name is placed exactly under the turtle. Look at the pretty greens the name is done with! I am absolutely in love with that thread. I wanted to do a finish that would make it a useable cross stitch gift, so I decided to make it into a lavender sachet that can hang or be placed in a drawer. I am very happy with the finished piece. I do think i am getting better and better at the finishing part, which I am quite happy for! It smells lovely as well because I chugged quite a bit of lavender in there! 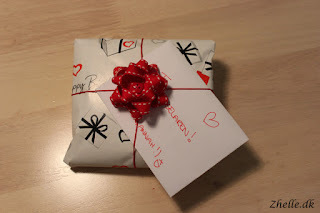 I felt so inspired after finishing it up, that I decided to be creative with the gift wrapping as well. Last year I bought a bow maker that helps with making ribbon bows. I made one of those in a beautiful red colour and placed a little heart in the middle. 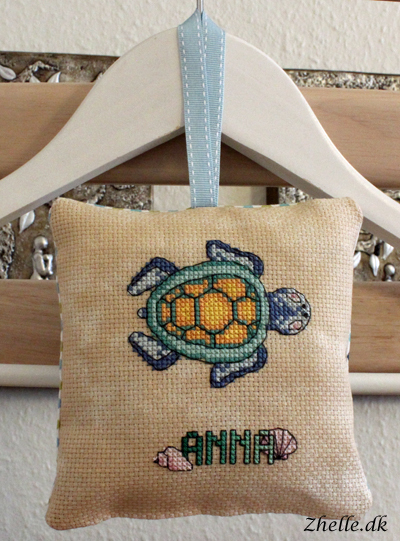 I do hope Anna likes the gift! And the lavender can be smelled through the paper, so it smells lovely too.